Ran McGhie's world has been turned upside down. A young, lonely and frustrated writer, and suffering from mental-health problems, he discovers that his long-dead mother was related to one of Glasgow's oldest merchant families. Not only that, Ran has inherited Newton Hall, a vast mansion that belonged to his great-uncle, who had been watching from afar as his estranged great-nephew grew up. Entering his new-found home, it seems Great-uncle Alexander has turned it into a temple to the written word - the perfect place for poet Ran. But everything is not as it seems. As he explores the Hall's endless corridors, Ran's grasp on reality appears to be loosening. And then he comes across an ancient lift; and in that lift a mirror. And in the mirror ... the reflection of a woman. 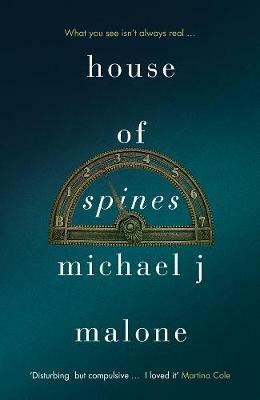 Michael Malone is a prize-winning poet and author who was born and brought up in the heart of Burns' country, in Ayr. He has published over 200 poems in literary magazines throughout the UK, including New Writing Scotland, Poetry Scotland and Markings. His career as a poet has also included a (very) brief stint as the Poet-In-Residence for an adult gift shop. Blood Tears, his bestselling debut novel won the Pitlochry Prize (judge: Alex Gray) from the Scottish Association of Writers. Other published work includes: Carnegie's Call (a non-fiction work about successful modern-day Scots); A Taste for Malice; The Guillotine Choice; Beyond the Rage and The Bad Samaritan. His psychological thriller, A Suitable Lie, was a number one bestseller on AU/UK ebook charts, and House of Spines soon followed suit. Michael is a regular reviewer for the hugely popular crime fiction website www.crimesquad.com. A former Regional Sales Manager (Faber & Faber) he has also worked as an IFA and a bookseller.